What is Your Space Mission? 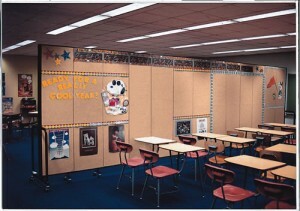 The most common use for room dividers is religious education classrooms (Sunday school classrooms). Room dividers are an easy way to cut visual distractions and decrease extraneous distracting noise by creating a division between the different classroom spaces. Dividers help cut down distractions and can result in increased concentration in religious education classes for any age group. More churches are offering child care and daycare ministries. This is the second most common use of room dividers within a church. Oftentimes these programs minister to children ranging from infants to pre-school. While the range of age is only five years or so. The difference in spatial needs at that young age is much different from a five-year span as adults. An open room can be divided into three different sections: nursery, playroom/reading area, and sleeping area. Obviously, larger programs can have several rooms, or divisions, for each area. Many states have rules and regulations which help to make sure that the certified instructors in the child care areas can see the tasks being performed by non-certified instructors/helpers. The height of room dividers and whether they are equipped with windows or not is an important consideration. Maintaining a clear line of sight between areas is also important when setting up dividers for child care. A room with several dividers in use during the day may need to have the dividers taken down and put away quickly when the last children leave so that the room is available during the evening for a large meeting, congregation meal, or some other ministry. The ease and flexibility to transform a space make room dividers valuable to churches maintaining multiple ministries. The third most common use for room dividers within churches is to help administrators manage the use of the multipurpose room. Sometimes multiple members or groups need to use a room at the same time, especially on weekends. Depending on the size of the room, dividers can easily be used to help make sure that groups can efficiently use the same room at the same time without interfering with each other. Certainly, a small group of about six members who wish to discuss a book they all recently read doesn’t need the same size room as a group having a wedding shower. The same is true for any several ministries or users. The names of the user groups may change, but the concept is the same: Room dividers can help manage the spatial needs in a multipurpose room.